This table board is made from one solid piece of shin kaya wood. It's truly a symbol of quality and tradition that perfectly embodies the beauty of the game. Our shin kaya Go boards are made of Tibetan spruce from Yunnan province in southern China. This type of wood is also known as ''dragon spruce'' and ''picea asperata'' in Latin. The lines are individually hand drawn. This board is paired with a set of double convex melamine stones. Melamine is an exceptionally durable compound commonly used when strength is essential, such as kitchen counters and industrial applications. 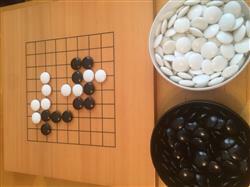 The set includes 181 black and 180 white melamine double convex stones, two plastic bowls (gosu) to store stones and a booklet explaining the essential rules and strategies of Go are also included with this set.his goban, along with our melamine stones, is perfect for learning Go, introducing Go to a friend or family member, practicing Go problems, or for quick Go games. Great for go clubs, starter sets or as a substitute for when you don't want to take out your expensive set of stones. 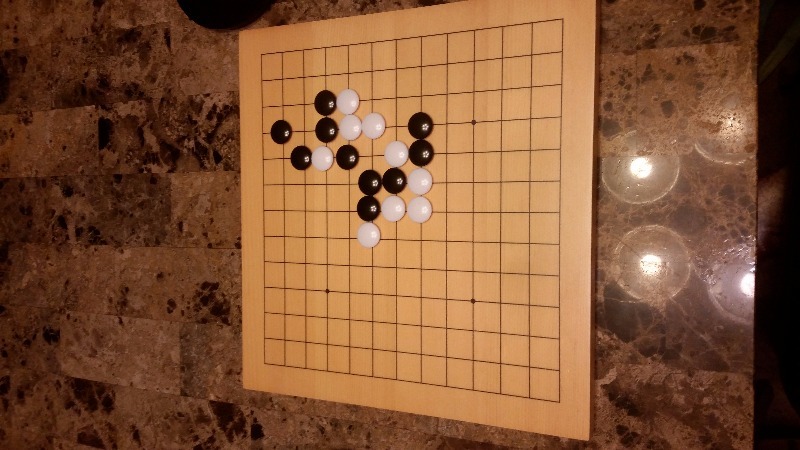 Reversible Go Board (Goban): 13x13 playing field on one side and 9x9 on the other. The smaller playing fields of this board keep your skills sharp by allowing you to play shorter games when you don't have time for a full-length one. Supreme Shin Kaya Wood: Playing Go on a quality wood table board connects one with the hundreds of generations of Go players who have played on shin kaya since ancient times. Please note, because of the nature of wood, the grain will be similar but not identical to the images you see in this product listing. 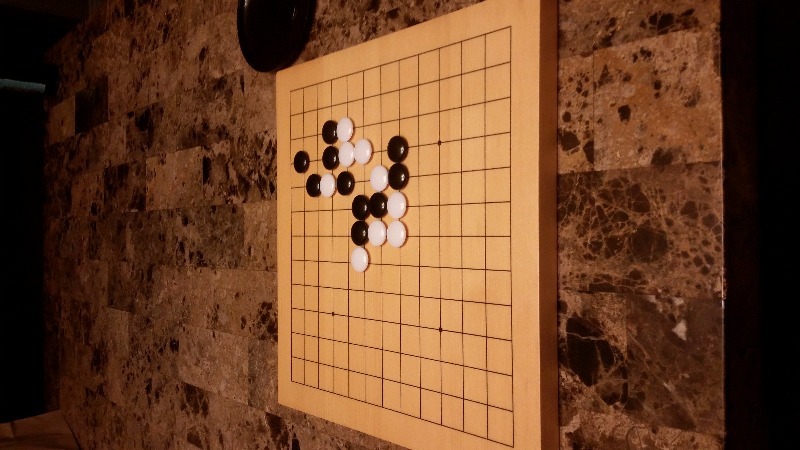 Japanese Standard Size: This board is Japanese standard size meaning the grids are 21.5 x 23 millimeters; The board's dimensions are 14 x 13 x 0.8 inches (35.5 x 33 x 2 centimeters). You're All Ready To ‚ÄòGo': 181 black and 180 white melamine stones are included; each stone is a 7.5 millimeter (size 28) double convex stone measuring about 7.5 millimeters tall and 21 millimeters wide (approximately 0.3 x 0.83 inches); 2 plastic bowls (gosu) to store stones are included and a booklet explaining the essential rules and strategies of Go. As was gift for someone else can not give feedback on product experience. I can only report that shipment of purchase was prompt and both outer and inner packaging was in excellent condition when received. Products arrived earlier than specified and in pristine condition. Stones and board look/feel very nice. I love this board and the stones! 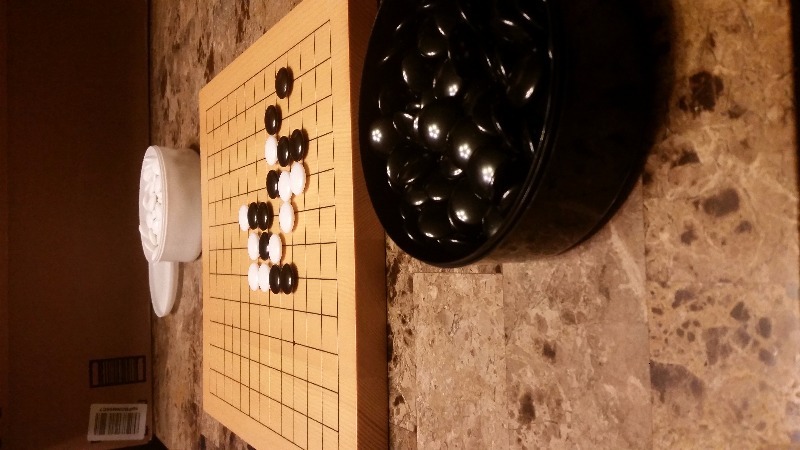 It makes for a really enjoyable experience playing Go in person and having 9 x 9 and 13 x 13 is good for short games. I wish I would have bought the heavier stones now. These Are a little to lite in my opinion.